Virginia Aldrich and I researched the events and circumstances leading up to and including the final divorce decree of Ann & William and there is a great deal of confusion concerning these events. We know from the 1900 Federal Census that Raymond, the youngest of the Van Bibber children was born in 1888. The five children of Ann and William were living in the orphanage on May 4, 1891. 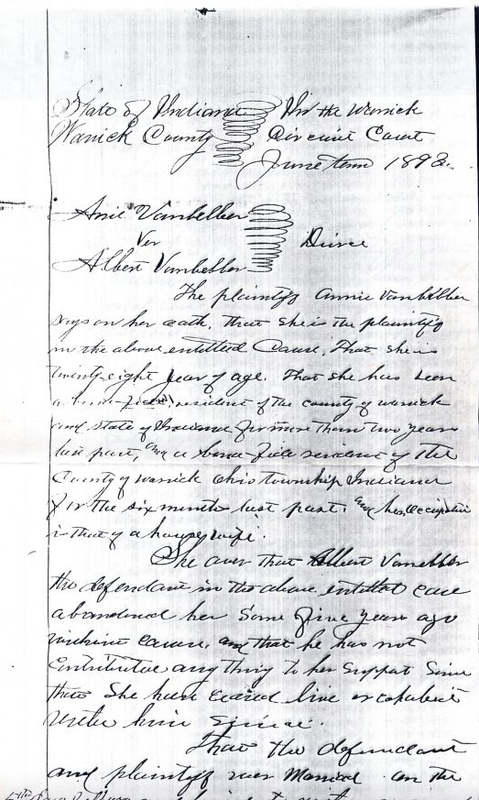 In the divorce petition, Ann states that she and William lived together until 1891.....The last paragraph of the second page states: the plantiff prays that the bonds of matrimony, therefore____the custody of the children and all__________heretofore existing between plantiff and defendant be forever severed and that she be given the custody of the children and all proper relief. The divorce was granted in 1893, however, the children remained in the orphange and never saw their parents again. What are the true facts here? Did William convince Ann to put the children in the orphanage and then continued to live together for another two years? Why did Ann request custody of the children when they were already in the orphanage? By 1891 the children were already being indentured to third parties. And the big question: Why did neither parents never attempt to clain their children.......or to even visit them? What could have happened to convince these parents to completely and forever forsake their children?